Fadnavis, whose government will complete four years in office on Wednesday, said the Sena understands the "political fact" that the two parties would suffer if they contest the polls separately as he said the coming together of Congress, NCP and others has "consolidated the opposition's vote bank". Notwithstanding the Shiv Sena's frequent criticism of the BJP-led governments at the Centre and Maharashtra, Chief Minister Devendra Fadnavis has expressed hope that the two parties stitch an alliance for the 2019 general and state assembly polls. The chief minister, interacting with a group of select media persons late Monday night, said he did not think the general and state assembly elections would be held simultaneously and that his party had favoured against the idea. He rubbished some recent media reports that cited a survey by a Delhi-based agency which claimed that six BJP MPs and around 50 of its legislators were likely to taste defeat due to their "poor performance". Fadnavis said BJP's internal survey was rather "encouraging" and also claimed that the party will have more of its MLAs getting elected. In the 2014 Maharashtra polls, the BJP had emerged as the single largest party, winning 122 seats of the total 288. Fadnavis, however, ruled out the possibility of the BJP having any understanding with NCP for the polls. "I think the political fact in Maharashtra right now is that the Congress, NCP and some other parties have come together. Their coming together has consolidated the vote bank of the opposition," he observed. He stressed that the BJP and Shiv Sena were "close to each other ideologically" and shared a big common chunk of the vote bank. "Both the parties would suffer (due to division of votes) in case their candidates are pitted against each other. We understand this political fact, so does the Shiv Sena. Hence, I think both the Shiv Sena and we will come together," he added. The chief minister also made light of the Sena's criticism of his government through its leaders and mouthpiece 'Saamana', saying it "does not have a bearing on the government". "The government is run by the cabinet which is held peacefully. We discuss issues and take decisions unanimously. There has not been a single decision in the last four years that we took by vote," he claimed. Maharashtra BJP chief Raosaheb Danve had on Monday said in Nagpur that the party's internal survey had showed that it would win 200 Assembly seats in the 288-member state assembly. 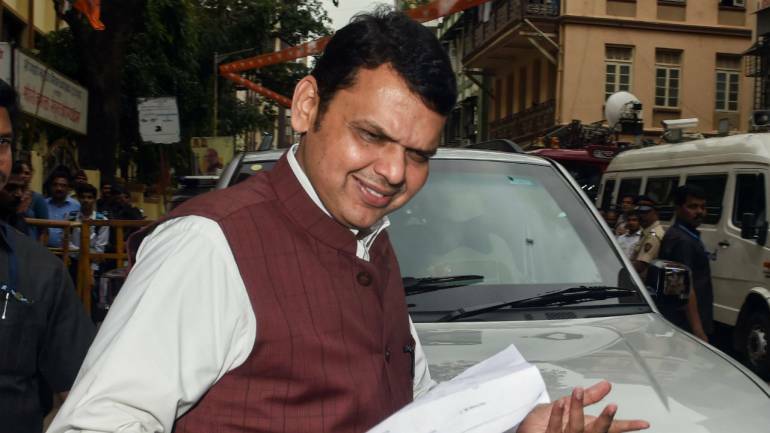 When asked about the chances of BJP-Sena alliance in view of Danve's comments, Fadnavis said the party's state unit chief only talked about the number of seats the BJP was capable of winning. "But we have to work together (with the Shiv Sena). We will decide on the number of seats to be shared (by both the parties) and will contest (accordingly)," he added. To a question whether the Maratha and Dhangar communities would still support the BJP in the polls in view of their intense agitation for quota, Fadnavis replied in the positive. He said "historically" it was seen that the demand for reservation and elections were unrelated. Citing examples, the chief minister said the previous Congress-NCP coalition had announced quota for Marathas ahead of the 2014 Assembly elections and yet suffered defeat. Similarly, the BJP won the civic body polls in Sangli and Jalgaon despite the pro-quota stir by Marathas being at its peak earlier this year, he added.